Neighbours are few and far between. The area is extremely quiet and traffic volume is very low. There are a number of locations nearby to launch a boat. There are some great fishing spots on and off the water. Elliots Bay (5-10 walk) hosts surfing competitions and is a popular surf beach for locals. Taupiri Bay (5 min walk) is one of the safest swim beaches in the North. Little Taupiri Bay (across the road) is your own private little bay (although the locals sometimes enjoy it as well). We regularly see dolphins, Humpback Whales and Orca's from the deck of our house! You will get to enjoy our new Spa (Hot Tub). We now have a Hot Springs Aria Spa Pool installed. This 5 person spa pool is top of the line and has been voted the best Spa Pool (Internationally) by Consumer Digest on more than one occasion. Sit back and make the most of the 35 jets this spa has to offer plus enjoy the sea views and the stars at night. 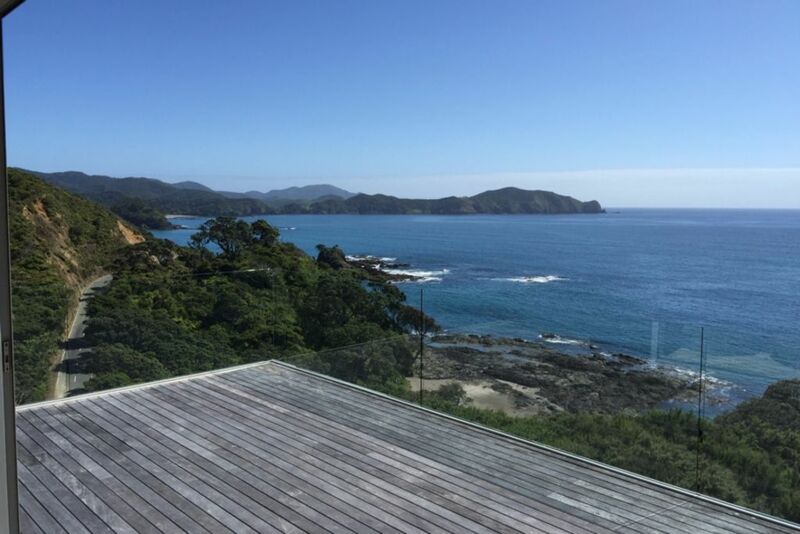 A luxury added just to ensure you really do get to relax at Little Taupiri, Stunning Views! The house is 250sqm with 3 double bedrooms with 1 x King bed and 2 x Queen beds. There is also a queen sized slat sofa bed, in the upstairs living room, that can be used as a fourth bed to accommodate 8 guests. The upstairs consists of a master bedroom with an ensuite, open plan kitchen/living room and internal garage. The downstairs consists of 2 x bedrooms, full kitchen, lounge and bathroom with bath and shower. Both levels have large decks to enjoy the views and sun. Double glazed windows throughout for warmth and quiet. Guests have access to kayaks, gym equipment including a spin cycle and free weights. You will need a car. The nearest shopping centre is Russell which is 25kms away. There are some beautiful walks in the area including Cape Brett and along Elliots Bay (and the joining bays). Someone will be there to let you in (or at least talk you how to check in via a phone call) and make sure everything is okay for you. Someone will also help lock up the place upon your departure, should you require this. The expectation is that you treat the home as if it was yours - with care. We simply ask that you leave the place as you found it. Please smoke outside. Please note there are security cameras in and around the property. These are used by the owners to ensure the property is protected when no one is there. The two internal cameras will be covered when guests are there but uncovered when the house is empty (for security purposes). You have stunning views of the East coast of Northland, NZ. You are 100m from the nearest beach. 200m away is another lovely beach and 500m away is the local surf beach. 55 inch, 42 inch and 32 inch. The most beautiful property in the most beautiful setting. Fantastic views, lovely modern home, all the added extras that make it so much better than a motel. We highly recommend this bach. It is the best we have rented. The driveway is very steep. we managed to take a 5.5m boat up but any bigger would be a problem. I am tempted to give this property a bad review so it doesn't get too booked up and we cant book it again. We had the perfect get away here. The property had everything you could ever need and couldn't have had a better view. Wasn't sure about the cameras in the living areas but other than that it is a very private property with a nice and quiet little beach. We struggled to get the kayaks up and down the steep driveway but really enjoyed snorkeling around. Would love to stay again. If we could this property 6 stars we would. Amazing views, luxurious accommodation - they really have thought of everything. Should be a sixth star. No expense spared on the amenities of this property. Location ( unbelievable ) View ( Amazing ) do yourself a favour and book in for as long as you can as you will regret not staying longer. Even has a gym set up over looking the ocean. A comprehensive list of things to do in the area will be provided.